3:39 what a beautiful thing that flat was! Every wiggle was shown by my tools. 3:33 here is the energy pulse "near 3:34"
2:44 for example, right now, why are all the EXMA's flat at 2050.5? I know why. Then I watch for what physical shifts in the energy field which change things, and when. 2:41 the main question I ask is "Physically, why are prices doing what they are doing? What's happening in the electric field?" 2:27 all my work is based on decades of careful observation, theorizing, writing equations, and testing the results with my own money. 9:30 the pivot price is 2048, R1 is 2058.5 and S1 is 2037.25, so I think those numbers set the range of the day. a rally ahead. 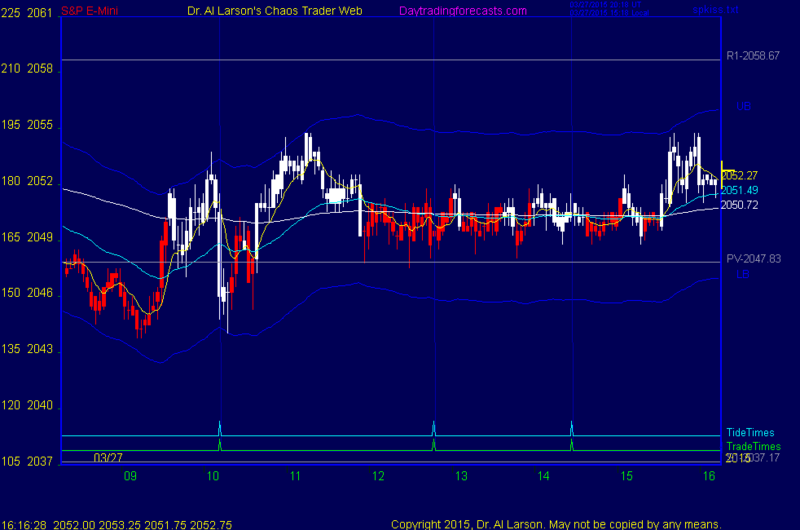 On a two day chart if we hold above yesterday's low we will have a 1 and 2 move of an up Chaos Clamshell.